Home remedies prove to be a boon when it comes to preventing or minimizing the symptoms of allergies. An allergy is a hypersensitive reaction by the body’s immune system towards harmless substances which are commonly referred to as allergens. This issue arises due to excessive activation of mast cells and basophils by immunoglobulin. Allergies cannot be eliminated but can be reduced using various methods; the mildest being the natural, herbal or homeopathic remedies. Mostly all allergy remedies aim at reducing the histamine level in the circulatory system. See the list of home remedies for treatment of allergies further down this page. A lot of people suffer from pollen allergy, but most of them do not even know that what they are exhibiting are pollen allergy symptoms. More often than not, they confuse these symptoms with those of common cold. The most effective way of treating these symptoms is by using natural allergy remedies as they are safer with no known side effects. Many people in the United States struggle with at least one type of allergy related symptom or asthma. 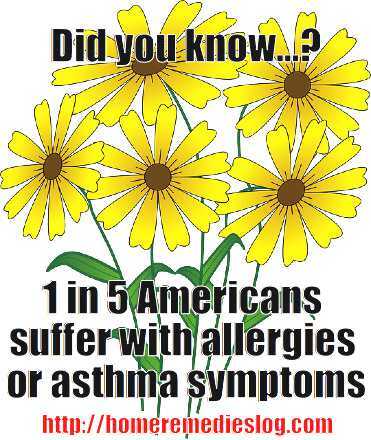 In fact, the numbers equal out to be 1 in 5 Americans suffer with allergies or asthma symptoms. There are several factors responsible for asthma and allergies, including genetics, pet dander, and indoor air pollution. In families with one parent with allergies, children are more likely to develop allergies as well. If both parents have allergies, children are 70 percent more likely to have an allergy. Americans typically spend almost their whole lives inside, and with air pollution levels being greater inside, this can be a big factor in the development of allergies. Being inside more often means there is more exposure to pet dander, as trace levels of dander are found in almost every home, whether or not there is a pet present. Also, normal household items, like pesticides, can contribute to indoor air pollution and allergies. Children account for almost half of all asthma related hospitalizations, and almost 2 million Emergency Room visits are due to problems with asthma. These high numbers of allergy and asthma related conditions and hospital visits have taken a toll on health care and business costs. One estimate shows that allergies cost health care systems and businesses $7.9 billion every year. This works out to be 10.5 million missed school days and 4 million missed work days every year. Below is an infographic showing the breakdown of allergies in America. This infographic is presented by Oransi, LLC. Allergies are caused by allergens which result in production of histamine by the immune system which affects various parts of the body such as the skin, nose, throat and digestive duct. The various allergens include food, insect bites, dander, medicine, pollen, grass, mold, yeast smoke etc. The different parts of the body respond to histamine in various ways which indicates allergy symptoms such as hives, skin rashes, difficulty in swallowing, respiratory problems, itching sensation in throat and nose, sore and red eyes and diarrhea or vomiting caused by indigestion that is triggered due to an allergy induced by consumption of certain foods. Normally, the body releases antibodies to destroy the allergens. The antibodies that are released for allergic reactions are known as histamine. The action of the antibodies results in the inflammatory response or reactions such hives, asthma, hay fever, eczema among others which vary depending on the allergen. There are some allergies that may be severe and even fatal such as anaphylaxis. Pollen Allergy Symptoms: A person suffering from pollen allergy will persistently sneeze while at the same time having a congested runny nose. (See our runny nose remedies article.) He will also experience itching of the the throat, palate ears and eyes. 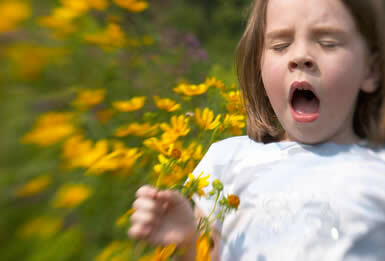 In worse cases, pollen allergies may trigger asthma or infections of the sinuses and ears. Another symptom is what is commonly referred to as hay fever although its correct name is seasonal allergic rhinitis. This is the chronic inflammation of the eyes and nasal cavities. There are various different allergy treatments ranging from anti-histamines to steroids and other medication all of which involves the usage and intake of a variety of artificial or processed drugs that are not used by many people even though it solves the problems in question because of its delayed results. For this reason natural home remedies are preferred over conventional treatments for an allergy. Other effective remedies include avoiding the allergens all together. There are various types of home remedies for the treatment of allergies; these include natural remedies, homeopathic remedies and herbal remedies. Natural remedies for allergies involve the use of natural products and resources that are meant to fight the allergies or to prevent allergic reactions. Use Quercetin to stabilize cells; This natural remedy will prevent mast cells from producing histamines by stabilizing them. Moreover, the body absorbs it faster therefore; it proves to be an effectual natural remedy. An allergic person is encouraged to eat onions, parsley, tomatoes, lettuce broccoli, apples and citrus fruits because they naturally contain quercetin. However, since the amount found in the foods is not sufficient, a quercetin supplement is recommended. Start taking 1000mg of the supplement daily approximately six weeks before the peak pollen season. Stinging nettle; an antihistamine treatment for pollen allergy symptoms. The stinging nettle produces the same effect as antihistamines without the side effects. It hinders the body from producing histamine. Since it is natural, it does not cause drowsiness or a dry mouth which are usually associated with antihistamines. It can be used fresh to make tea or tincture. It is also available in capsule form which should be taken in daily doses of 300mg. It can also be used to treat the symptoms of allergic rhinitis. Taking of about 600 mg daily for up to a week can help to reduce allergic reactions. Use Isotonix OPC-3 as an antioxidant; This is a natural supplement that is made of fruits and wine. It contains edible fruit seed, type A bilberry and bioflavonoid extracts from citrus fruits. It also contains extracts from the pinus radiata tree and red wine. It is a strong antioxidant that protects cells from being damaged by free radicals, the body cells therefore withstand any damage from pollen allergy symptoms. Goldenseal; Another of the natures home remedies is the use of goldenseal. Since it has antibacterial and immune booster properties it can assist in minimizing the allergic symptoms. A teaspoon of goldenseal should be mixed with a teaspoon of borax in a pint of boiled water and kept aside. After 2 hours, shake the mixture well and pour it on the hand to be sniffed. This remedy opens up the nostrils. For a more effective result the sniffing step is to be repeated at least 5 times per day. Butterbur: Yet another a natural remedy is butterbur which is recommended for respiratory problems such as asthma and bronchitis. For faster results one should take about 500 mg daily for a period of four months to heal or significantly reduce the allergic reactions. 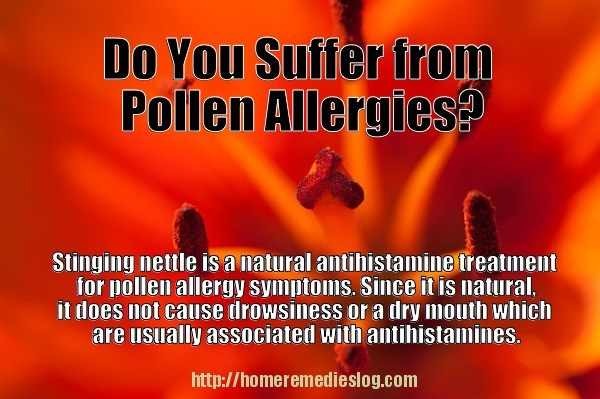 Some herbs also have an antihistamine result in the body thus they can help to prevent allergies. Few herbs also build up a resistance against the allergens. Chamomile for Hay Fever is one of the herbal remedies that is famous for its anti-inflammatory and antihistamine properties. Due to this aspect, it is a highly recommended remedy for allergic symptoms such as hay fever. It is added to tea and gives out a mint like taste and scent. Oranges have vitamin C which has antihistamine properties and are known to boost the immune system hence they are effective in preventing respiratory inflammations that arises from various allergens that affects the lungs, nose and throat. There are other fruits that contain vitamin C like lemons, grapes, plums and so on. Ginger for Allergies; Another useful herb is ginger. With its anti-microbial properties it inhibits platelet acting factors that respond by causing inflammatory reactions, it also works like vitamin C by preventing excess production of histamine which results in allergic reactions. Thus ginger proves to be an effective natural herbal remedy against allergies. Eucalyptus Oil: The eucalyptus has varied properties and its oil can be applied on the chest which can assist in clearing the chest and avoid congestion. It is also effective in clearing the nasal cavity from blockages. Honey for Allergies: A natural delicacy, honey (especially Manuka honey)can effectively help the body to resist allergens. 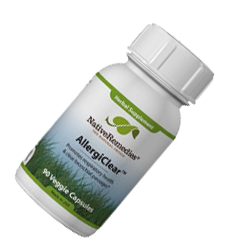 CLICK THE BOTTLE to learn about AllergiClear, an amazing herbal remedy for allergies! Most of these remedies are simple and have the ability to help the body in avoiding allergic reactions. Rinsing the nostrils with salty water: Using salty water to rinse the nostrils is an effective way of washing out the pollen grains. It can be done using a cupped hand or preferably a neti pot. Non-ionized salt works best. Put about half a teaspoon into some lukewarm water and use the spout of the neti pot to put some into one nostril. the head should be leaning to one side. Let the water drain out of the nostril before repeating the process on the other nostril. Green Tea: Starting with green tea that can be easily prepared in a few minutes, it has an antihistamine property and results in a quick relief from allergy. A cup or two can bring about a noticeable improvement in the body which aids to resist allergic reactions. Apple cider vinegar which is found in every kitchen also possesses an effectual property that can treat dry itchy scalp and skin caused by allergens. Since it is bitter to taste, it can be added to food or mixed with water. Additionally, being acidic in nature, it also helps as a disinfectant. Inhale the steam of essential oils and drink peppermint tea; Inhaling the steam of essential oils will decongest the nasal passages. To gain maximum benefit from essential oils like peppermint oil, one should take hot peppermint tea. The tea will not only act as a decongestant but it will also act as an anti-bacterial and anti-inflammatory. In addition, home remedy will also soothe the irritation of the throat. Eye Drops: Allergic reactions that affect the eyes can be prevented using eye drops which are very effective for eye related allergies. Eye drops makes the eyes moist which aids to flush the allergens away and provides a quick relief. Garlic, a vital ingredient in every meal, has considerable antiviral properties and hence is a very effective home remedy for an allergy. It is more effective when eaten raw rather than cooked. Four cloves of garlic in honey can have a great effect in preventing allergies that are common during the cold season. To conclude, nature provides us with a wide variety of natural allergy remedies and foods to cure ailments and allergic reactions and we ought to make use of these gifts of nature to heal various problems that are associated with allergy. They are safe and will not lead to other health complications. Allergies are caused by the immune system being run down. Discover some more natural remedies to treat an allergic reaction using herbal supplements by watching this quick video from a registered dietitian. Join our weekly home remedies newsletter and get a different free home remedies ebook every single week for a whole year! 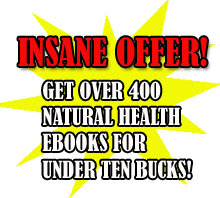 If you buy my home remedy book, you get immediate access to the private members area where you can download up to 410 natural health ebooks for free. Good stuff Sam! 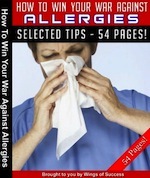 This is one of the best articles I have read on home remedies for allergies, thanks again!